The obvara firing process, which originated in Eastern Europe around the 12th Century, involves scalding the finish on the pottery to seal the porous surface. 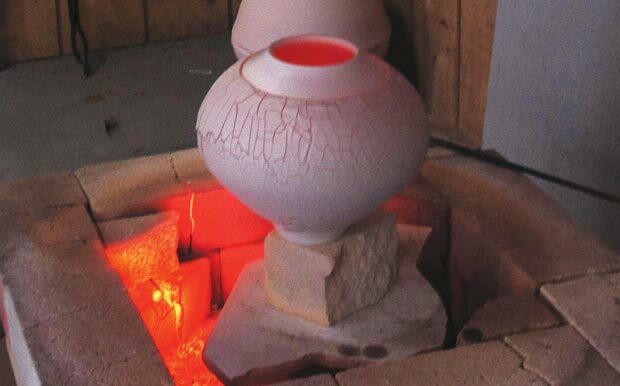 Similar to the raku pottery process, a bisqued pot is heated, in this case to 1650°F (899°C) and removed from the heat. The difference is that the pot is then dipped into a specific obvara yeast mixture before being dunked in water to rapidly cool the piece. The effects are quite stunning. 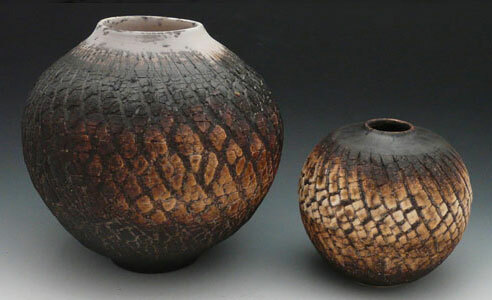 In this post, an excerpt from her video Raku Firing: Expanding the Potential of the Raku Kiln, Marcia Selsor shows how to enhance the effects of an obvara firing by texturing the surface and then shows the exciting process.- Jennifer Poellot Harnetty, editor. The obvara firing technique is a technique originally used to seal low fire pottery. It is believed to have originated in Eastern Europe during the Middle Ages. There is a revival of the process underway in Ukraine and the Baltics. It is nicknamed “Baltic Raku.” The solution which I call the “brew” is a mixture of flour, yeast, and water. See the recipe here. It is mixed three days in advance of firing. 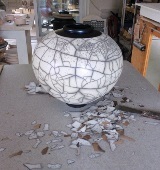 Pieces are made and bisqued before the final firing. Using a raku kiln, fire a batch of pots to 1650 degrees F. Pieces are removed one at time, dunked into the brew and then quickly into water. Then they air cool. The brew burns quickly on the surface of the piece before going into the water. The water stops the burning and color change. If the kiln gets below 1500 before al the pots are processed, turn the kiln back on and take it back to 1650 F. It the piece is too cool the obvara firing process doesn’t work and makes a slimy mess. To learn more about Marcia Selsor or to see more images of her work, please visit http://www.marciaselsorstudio.com/. Pick up tips to expand the potential of the raku kiln when you download this freebie, Successful Tips & Techniques for Raku Firing. I have sourdough starter. Why is this process using yeast? If it is so old yeast eas not invented? I don’t know if i would wait two weeks to use it again, after a couple of days of fermenting that stuff gets ripe. I would not want to know what two weeks would smell like. How long is the mixture good for? If I want it to work, say 2 weeks later, would it still be good? Would I need to maybe keep adding a bit of sugar? most say four days. Others try to revigorate the yeast by adding more. And yes it gets very ripe. hope you had great success. Has anyone ever tested obvara pots for food safety? Ive have found mixed results on this elsewhere on the web. Also would it work as well on a pot fired to cone 6 prior to the obvara to give the pot more durability? Not the same. Sodium Silicate is water glass. Once it dries it can be very sharp. How do you keep the mixture warm? Can hot/warm water be added to the mixture? I wonder why it didnt color the projected portions. Can anyone tell me if sodium silicate applied to a pot is harmful to the kiln or kiln elements (fired to cone 06 for a bisque and cone 6-7 for a glaze firing (electric kiln)? Is it like salt? Does it react with glazes? I work in a community studio. Just rinse them well. there isn’t a residue unless it is severely under fired. I burnish smooth piece with Terra sig or use a highly textured surface which responds well to the obvara. I don’t use wax on Obvara either. I don’t even thing I could apply it to a highly textured surface. I am glad the Obvara technique is so widely spread. There is a really good link on Fabebook called the Obvara Firing technique. There are many there doing amazing work. As for me I wash the pots with a sponge. They don’t need to be covered with paste wax because they are sealed with obvara mix. Moreover I usually burnish the surface. Marcia if you are out there. I need your help. I have a couple of pots where the obvara is starting to flake off, what did I do wrong? I don’t think the sugar is what causes the black but rather causes the yeast to ferment.Thanks for posting your variations. There are many. The milk idea is even in India. There is much research going on about obvara lately. Here is a link to my friend, Janice Chassier , who presented a session on the history of Obvara at the last NCECA conference after conducting research in Ukraine and Belarus. Great video. I made obvara several times. I added cup noodle (instant chinese noodle)and vegetable oil. As for me I don’t like the effect sugar produces, it gives too much black colour. Though it can be fixed reducing the temperature. Yes there are many recipes. The most peculiar one is a mix of used cucumber pickle and rye flour (I haven’t tried yet). Obvara is a traditional russian technique. Milk obvara is very popular.